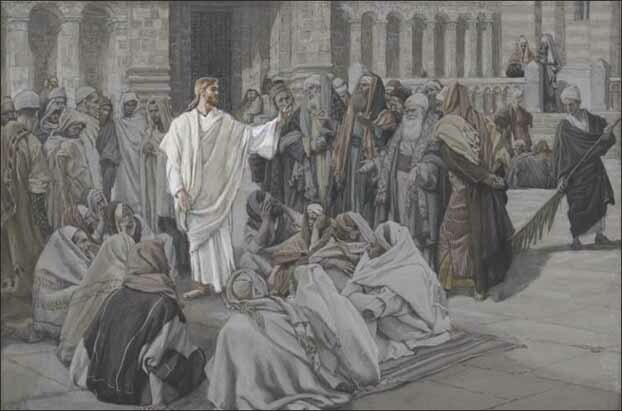 [For the Gospel] After the feast of tabernacles came that of the Dedication, and Jesus remained in Jerusalem. The hatred of His enemies bore Him is greater than ever. They come round about Him, that they may make Him say He is the Christ, and then accuse Him of claiming a mission which does not belong to Him. Jesus designs not to reply to their question, but tells them that they have seen His works, and that these give ample testimony of His being Christ, the Son of God. It is by faith, and by faith alone that man can know his God. God manifests Himself by His divine works: man sees them, and is bound to believe the truth to which they bear testimony. By thus believing, he has both the certitude of what he believes, and the merit of believing. The proud Jew rebels against this: he would fain dictate to God how He should act, and sees not that such a pretension is impious and absurd. But, if Jesus openly declare the truth, He will scandalize these evil-minded men! Be it so; the truth must be preached. Our Lord has others to consult besides them; there are the well-intentioned, who will believe what He teaches. He, therefore, utters these sublime words, whereby He declares, not only that He is Christ, but that He is God: “I and the Father are one.” He knew that this would enrage His enemies; but He had to make Himself known to the world, and to arm the Church against the false doctrines of heretics, who would rise up in future ages. One of these to be Arius, who will teach that Jesus is not God, but only the most perfect of creatures: the Church will answer, that Jesus is one with the Father, consubstantial with the Father: and then, after causing much trouble and sin, Arianism will die out and be forgotten. The Jews mentioned in today’s Gospel are the forerunners of Arius; they understand what our Lord says He is God, and they seek to stone Him. Jesus gives them a fresh grace; He shows them why they should receive what He here teaches; He reminds them, by the Scriptures they know off by heart, that the name god has sometimes been applied, in a limited sense, to men who had certain high offices put upon them by Heaven; and then, He bids them think of all the miracles they have seen Him work, which so plainly testify to His being assisted by His Father, and once more declares Himself to be God, saying: The Father is in Me, and I in the Father.” But men hardened in obstinacy, as these are, cannot be convinced: and the sin they have committed against the Holy Ghost is working its effects. How different is it with the sheep of this divine Shepherd! They hear His voice; they follow Him; He gives them eternal life, no man shall pluck them out of His hand. Happysheep indeed! They believe, because they love; and as it is through the heart that truth gains ascendancy over them, so is it by pride of intellect that darkness gains admission into the soul of the unbeliever, and lasts as long as pride lasts. Alas! Poor unbeliever! He loves his darkness; he calls it light; he blasphemes when he thinks he reasons, just as these Jews crucified the Son of God, that, as they said, they might give glory to God. Lesson from the Book of Leviticus. In those days, the Lord spoke to Moses, saying, Speak to all the multitude of the children of Israel, and thou shalt say to them, I am the Lord your God, You shall not steal. You shall not lie: neither shall any man deceive his neighbor. Thou shalt not swear falsely by My name, nor pro­fane the name of Thy God: I am the Lord. Thou shalt not calumniate thy neighbor, nor oppress him by violence. The wages of him that has been hired by thee shall not abide with thee until the morning Thou shalt not speak evil of the deaf, nor put a stumbling­block before the blind; but thou shalt fear the Lord thy God, because I am the Lord. Thou shalt not do that which is unjust, nor judge unjustly. Respect not the person of the poor, nor honor the counte­nance of the mighty; but judge thy neighbor according to jus­tice. Thou shalt not be a detractor, nor a whisperer among the people: Thou shalt not stand against the blood of thy neighbor. I am the Lord. Thou shalt not hate thy brother in thy heart; but reprove him openly, lest thou incur sin through him. Seek not re­venge, nor be mindful of the injury of thy citizens. Thou shalt love thy friend as thyself. I am the Lord. Keep ye My laws: for I am the Lord your God. I will extol Thee, O Lord, for Thou hast upheld me and hast not made my enemies to rejoice over me. V. O Lord, my God, I have cried to Thee, and Thou hast healed me: Thou hast brought forth, O Lord, my soul from hell; Thou hast saved me from them that go down into the pit. O Lord, repay us not according to the sins we have com­mitted, nor according to our iniquities. V. (Ps. 78: 8-9) O Lord, remember not our former iniquities: let Thy mercies speedily prevent us, for we are become exceeding poor. V. (Here all kneel down) Help Us, O Lord our Saviour: and for the glory of Thy name, O Lord, deliver us: and forgive us our sins for Thy name’s sake. Deliver me from my enemies, O my God, and defend me from them that rise up against me, O Lord. I will wash my hands among the innocent, and will compass Thy altar, O Lord: that I may hear the voice of Thy praise, and tell of all Thy wondrous works.